FABY Creates Look for BCA To Support Bright Pink! 50% of sales from the 5 shades used to create this look are being donated to Bright Pink (www.brightpink.org) for the month of October! Apply FABY Oxygen Base Coat to nails. Apply two coats of FABY My Little Secret on each nail and let them dry. Paint a brush width of each color on a makeup sponge. We started with FABY Tell Me A Story followed by FABY Do You Have Candy and FABY I Was Born Yesterday. Dab each nail with the sponge. Repeat this step until you get the desired coverage. Use a brush and nail polish remover to clean up the excess polish around your nails. 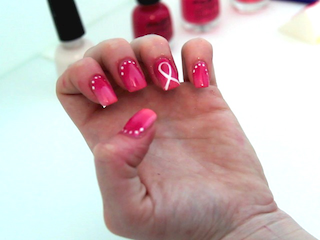 Using FABY Optical White and a striper tool to draw a BCA ribbon on your ring finger. Use FABY Optical White and a dotting tool (or a bobby pin) to draw dots around the base of each nail. 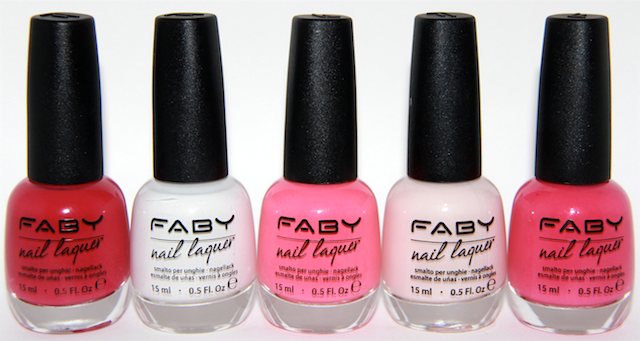 Apply FABY Top Coat to each nail and be sure to swipe the tip of your nail to seal the edge. WATCH THE VIDEO TUTORIAL HERE! Bright Pink is on a mission to save women's lives from breast and ovarian cancer by empowering them to live proactively at a young age. Bright Pink is the only national non-profit organization focusing on the prevention and early detection of breast and ovarian cancer in young women, while providing support for high-risk individuals. For more information visit www.brightpink.org. Love the nail art! Pink is my favorite color!